China's Shanghai Composite was down 0.2% today (Wednesday) ahead of a three-day holiday that will close markets until Monday. Starting Thursday and continuing through Monday, China will mark the 70th anniversary of the end of World War II with a massive parade. Hundreds of factories have been shut down to ensure that the 12,000 troops, 200 fighter jets, and 500 pieces of military hardware will have a smog-free parade. 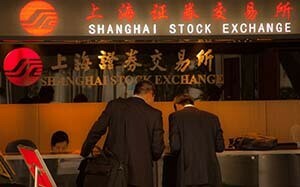 Investors worldwide could use a break from China's Shanghai Composite and its recent volatility. The Shanghai Composite was extremely volatile again Wednesday as concerns over the world's second-largest economy persisted. After falling as much as 4.6% intraday to a low of 3,019, China's key benchmark ended the day down 0.2%. China's blue-chip CS1300 eked out a 0.1% gain. The smaller Shenzhen Composite, meanwhile, closed down 2%. The Shanghai Composite started September on shaky ground. The benchmark slipped 1.2% Tuesday, after ending August with a loss of 11.8%. That wiped out all of the year-to-date gains the composite had logged. Providing a cushion for Chinese stocks Wednesday was a pledge from nine Chinese brokerages to buy over 30 billion yuan ($4.71 billion) worth of shares. That followed news on Tuesday that major Chinese brokerages are stepping up their contributions to support China's stock market. Other new developments include reports that regulators have pressed brokerages to clean up "grey market" lending by the end of the month. Plus, the People's Bank of China (PBOC) plans to tighten rules on trading of currency forward contracts starting in mid-October. But all that policy making, and lack of clarity when it comes to policy intervention, has global investors even more confused and concerned about the health of China's economy. Most believe China's government no longer has the means or the muscle to support the economy like it has in the past. And Tuesday's warnings from the International Monetary Fund (IMF) aren't easing investors' concerns. The IMF cautioned China's slowdown will continue to have an impact on the rest of the global economy. We've seen the impact on global stock markets all week. Poor manufacturing data was released in China Tuesday. That was part of the reason the Dow sank 469.88 points, or 2.8%, to 16,058.35. The steeps declines in the Dow, S&P 500, and Nasdaq put the trio down 10% or more (correction territory) from their 52-week highs.